The pool area was designed with relaxation in mind, with 7 pools to choose from, plus an oceanfront jacuzzi just steps from the sand. You’ll love the new Blanca Blue restaurant with its contemporary design and fresh menu full of locally sourced ingredients. BocaDos Stk is our steakhouse restaurant, boasting a show kitchen where you can feast your eyes on dry-aged meats and our in-house lobster tank while our chefs broil up the finest quality steaks and seafood to order. Our unique lobby is comfortable and classy, with eye catching details inspired by the ocean. Amazing things are happening at the brand new Garza Blanca in Los Cabos between now and May 10! All of the details are filling in! Be one of the firsts to enjoy the opening of our brand new pools, restaurants and outdoor spaces! Valid booking from: 03/22/2019 to 05/10/2019. Travel dates: from 03/22/2019 through 05/10/2019. (1) Rates are per person, include all taxes and service fee and are based in triple occupancy. Rates are based on our Junior suite. Be the first to book with us. We always deliver on our promises. There are no surprises when booking with us. When guests put their trust in Tafer Hotels & Resorts, we respond in kind and take our promises very seriously. For being the first to book a stay at the brand new Garza Blanca Resort & Spa Los Cabos, you can be sure that you have received our most favorable rates available. 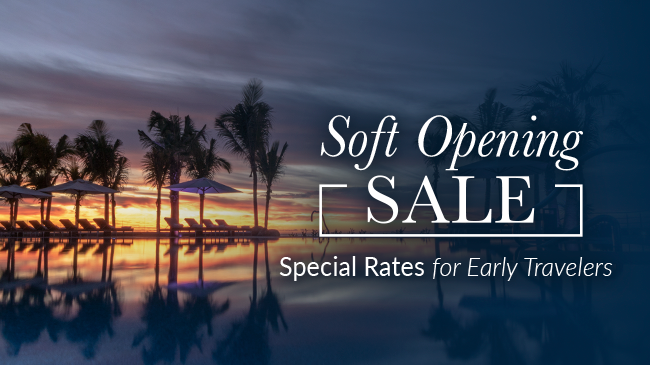 During our soft Opening period, we invite you to come and experience our new resort at a special price! The resort will be fully open later this year, and in the meantime we are ramping up to our full unrivaled range of masterfully tailored accommodations. Our current services include: luxurious suites, 6 pools with ocean view, a large oceanfront jacuzzi, access to our private beach, spa treatments, bars, room service, restaurants and snack areas.